Welcome to our guide to the Staffordshire Bull Terrier. The DogExperts.info website aims to ask questions to breeders, vets and experienced owners to get the answers to your most frequently asked questions about the Staffordshire Bull Terrier breed of dog. Some of its popular nicknames include Staffie, Staffy, Staffy Bull, SBT and Nanny Dog. We would love to feature your dog and publish any photos or pictures of your Staffordshire Bull Terrier you would like to email us. Are you looking to buy a Staffordshire Bull Terrier – then see our list of Staffordshire Bull Terrier breeders. We have a fantastic interview from owner Naserah who gives us the fascinating story of Mr Fu. I’m Nas and we live in Melbourne, Australia. How long have you owned a Staffordshire bull terrier? 11 years. I have had three Staffordshire Bull Terriers. Buddha Khan, Mr Fu and Tara. Buddha was 10 years old when she passed away in 2016 because of an aggressive tumour in her stomach. Mr Fu will be 11 years old and Tara will be 8 years old this year. From a registered breeder who sells pedigreed and papered Staffordshire Bull terriers. I bought Buddha, Mr Fu and Tara from the same breeder. We are still in regular contact and she follows their progress through Facebook. The breeder is a responsible breeder who is registered with Australia National Kennel Club (ANKC) where dogs are bred ethically and after medical testing to ensure the dogs are healthy. I cannot compare them with other breeds as they are the only breed which I have ever owned. I first came in contact with the breed by fluke and connected with Buddha. I then went on to get Mr Fu and finally Tara. They are extremely loyal, loving and very well connected with their humans. They are intelligent and pick up things that are taught very quickly. I have even taught them concepts of ‘right’/’left’, forwards/backwards , inside /outside etc and they all picked it up very quickly. I can walk them and tell them to turn right /left and they will do so. All three of them understand sign language as well. I often sign to them, without saying anything and they know what it means. I am also trilingual and speak to them in three different languages and yet, they now what I am saying. They are always ever willing to please and will do anything to make me happy. I love them so much and they are the centre of my universe. 1) It is important to provide them with enough exercise and mental stimulation. Staffordshire Bull Terriers are active go-getters. They must have regular exercises and stimulation. They like to play and play they must for stimulation. Otherwise they will become rambunctious and bored — which they usually express by barking and destructive chewing. Thank goodness I am lucky with mine. They are walked daily and individually. I play with them daily. They go for a swim twice a week and they get a massage once a month. 2) Providing enough socialization, training and retraining whenever a behavior turns deviant. My dogs are very social and friendly but I can read their behaviors well and recognize when they are scared, unsure or spooked. When they were young, I introduced them to everything and anything possible for example, loud noises, fireworks, different animals so that they are well aware of things. That helped them a lot. I invest a lot of time retraining them should anything happen. For example, when they developed a bad habit of jumping of visitors because a visitor allowed it, I retrained them again but I also put my foot down that my visitors adhere to the same strategy. 3) I must constantly show them that I am the boss. My staffies are capable of learning a great deal, but they have a mind of their own and can be manipulative and obstinate at times. At times, they want to be the boss so that they can get their own ways. I am very consistent with my strategies. A ‘no’ is a ‘no’ and there are no two ways about it. Thank goodness I manage behaviors at work all the times so the basic rules of behavior management applies to my dogs too. I use a lot of voice modulation with my dogs. They know my happy voice but they also know ‘I am in trouble’ voice and will immediately comply. I can count down from 5 to 1 in these cases and they will start to comply. As a staffy dog owner, one must show them, through absolute consistency that you mean what you say. 4) Routine is King with my dogs. They find changes hard to cope with so I try as much as possible to keep things same. As soon as a change happens, that is when my retraining of them happens to help them cope with changes. For example, if I need to change their food, it is introduced gradually, not suddenly. If it is school holidays for me and there is an absolute change of routine where I am at home, I ensure that before I go back to work, I reintroduced my old work routine. All three of them have beautiful temperament. They are well socialised with other dogs, even with smaller breeds and enjoy playing. All three of them have very different personalities hence that is why I walk them individually. I love walking them individually as it gives us some quality time together, to connect and understand each other better. I talk to them on our walks and we do things that each dog loves. They all love people but Buddha loved her men more. Each time we went for a walk, she would try to run up to a man and say hello to him. Mr Fu, on the other hand, loves his women. Tara loves children as she used to spend her first few months in my classroom with children with autism. They each have different skills e.g. Buddha used to open doors to let her sister, Tara, into the back room to retrieve soft toys to play with. Buddha would keep the other two in check and was the first to come to ‘tell’ me if something was wrong. E.g. a few years ago we went to somebody’s house for the weekend. I was resting on the couch when Buddha came rushing in and looked at me. Instinctively, I knew something was wrong. I asked her where Mr. Fu was. She immediately took me to the end of the garden where we found a hole. He was one years old then and had jumped out of the hole. Luckily, I found him, with the help of the police. Similarly when Mack the galah escaped from the cage, it was Buddha who alerted me to it. We found him when we went to the park and he landed on her back. He actually went home perched on her back. Mr Fu is very much a Mummy’s boy. He loves it when I am at home. He will tolerate me going out to work and spends the day sleeping in my bed, waiting for me. However, if I am ill, he will try and stop me from going to work. A couple of years ago, while I was recovering from pneumonia, I decided to go to work. Mr Fu plonked himself in front of the door, refusing to budge. I had to put him in the room. Half an hour later, I received a call from my neighbour. He told me he found Mr Fu in front of his door, making staffy sounds. I had to go back home to get him. I discovered that he chewed through the fence to get to the neighbour so that I would be called home, something he never did before. Mr. Fu loves his women. Each time we go for a walk, he would stop and look at any woman passing by him, hoping for a pat or a hello from them. He is such a charmer and never fails to elicit a smile from any women. He loves tennis too and whenever we walk past the tennis courts, he will stop to see people play. If it’s a good game, he will stay longer. Why that happened? I guess it’s because I often leave the TV on for them as part of sensory stimulation, when I am at work. During the tennis season, I would come home and find him sitting in front of the T.V, watching tennis! Perhaps, that is how he developed a love for tennis. As he gets older, he has become a tad stubborn. He has a mind of his own and when we go walking, if he doesn’t like the direction we are going, he would put on the brakes and froze on the spot. If I attempted to reach out to him to move him, he would roll over and played dead. Tara is very different. She is always ever willing to please. She learns her tricks quickly because she knows that will make me happy. 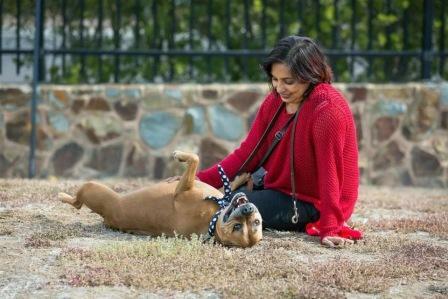 When we go for a walk, Tara would often want to go up to a child to get belly rubs. This is because she was an autism dog in her first year of life and went to work in my class, working with children with autism. She calmed all the children in the class and encouraged three of them to start talking. Interestingly, when she stopped going to my school, she started finding children with autism in the park. Whenever we went for a work, if she sat down and looked at a child and then at me, I knew she had found a child with autism. She behaves very differently around them and is very calm and gentle. Interestingly, she connected with an old man in our park and thrice before he had a stroke, she acted very strangely, crying after him as he left the park. Perhaps that is a fluke but who knows, perhaps, she can detect that he was going to get his stroke. I believe the Staffordshire bull terrier is quite a popular dog on social media/Internet these days, can you tell us how this started? The Staffordshire bull terrier (often called Stafford or Staffie) was brought into existence on the early 1800s and is a cross between the bulldog of the day and the old English terrier – a breed which is now extinct. These two breeds were chosen to produce a dog with a combination of both strength and agility. The early dogs did not have very specific pedigrees because the importance was a game fighting dog. The miners and ironworkers of Staffordshire began to foster the breed and the qualities of gameness, intelligence and loyalty were developed. The Staffordshire bull terrier was recognised by the English Kennel Club in 1935. The breed is known for their intelligence and stubbornness and when trained and socialized from an early age, they make truly wonderful companions. What are your feeding routines, such as how often and what types of food do you feed the Staffordshire bull terrier. In the mornings, they have a dentastik plus some peanut butter in a kong. I cooked their food for them. They mainly like chicken with veggies such as carrots, baby corns, beans, spinach with pasta or rice vermicelli, cooked in coconut oil. Psyllium husks and fish oil is added to their nightly meals. After dinner, they each have a stick of carrot as a treat, snow peas, apples, pears and Monte Carlos. These are cookies which I like with my cup of tea after dinner. My dogs have taken a liking to these cookies too and they have a cookie each!! I know it is naughty of me but I allow them this indulgence with me. My dogs hate green peas and broccolis. Whenever I give them green peas, they would spit it out. With broccolis, they would leave it in their bowls. Interestingly, if I cut it in smaller pieces, they would eat it. I personally feel they dislike green peas because with green peas it is hard for them to bite the peas and then chew it in their mouth as it is slippery. All three of them were so healthy when they were young but as they grew older, they developed some health issues- just like we humans do. Buddha was very healthy but developed aggressive cancer in her stomach and had to be put to sleep, leaving a huge hole in our lives. Fu developed arthritis when he turned 8 and Tara has just started showing signs of arthritis. Currently, they are on Zydex as well as turmeric paste. All three of them developed anxiety with the onset of seniority and had to be medicated to regulate the serotonin levels to help them deal with separation anxieties when I go to work. The worse was when Buddha passed away and it took both Mr Fu and Tara about a year to bounce back. Currently, they are supported with a monthly massage and swimming twice a week. Interestingly, last September with the onset of spring, both Mr Fu and Tara developed bad hay fever- something I never thought dogs would get. It seems that they do get affected by seasons of the year. All three of them hated winter and get so miserable in the cold. In winter, they wear a jacket as their short hairs do not give them adequate warmth. In summer, I have to be really careful with them as bull breeds have a tendency to suffer from Brachycephalic airway syndrome (BAS), a condition that is more common with short-muzzled, flat faced dogs and will overheat and get breathing difficulties if the weather is too hot. One summer when it was about 40 degrees Celsius, Tara fainted even though she was in the house which was air-conditioned. As a result of that incident, every summer, they wear cooling jackets made of chamois which cools them down. Obviously grooming is another major aspect of owning a Staffordshire Bull Terrier, can you offer any tips, advice and popular accessories for your Staffordshire Bull Terrier? It all depends on the individual dog owners. My dogs get their baths weekly. While some people may think this is bad with them, I can assure you that it is the best thing for my dogs. However, they do get their protein treatment from their weekly coconut massage oil from me. They have healthy and shiny coats and I can boast that they have never ever had fleas in all their lives with me. If some owners are worried, they can resort to a quick weekly rub down with a damp cloth/chamois. I am a very practical person and the things I buy for my dogs often have purposeful intentions. For example, in winter, they have winter coats made of fleece and which is also snug that it works as a thunder shirt .The coats give them deep pressure which helps calm and relax them. In summer, they wear cooling jacket which are made of chamois. You wet it and put it on them for the whole day. The chamois helps cool them down. Their harnesses are specially bought from Stafford Rescue Victoria. It is specially made and based on the T-Touch methodology. If they pull on the harness, it presses against certain pressure points on their bodies and calms them down. 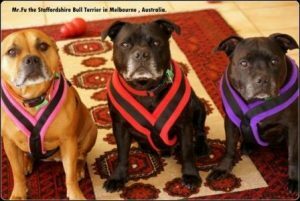 Each of my staffies have their individual harness in colors that are allocated to them. For example, Mr. Fu’s color is red and everything of his is red. Buddha’s color was purple and Tara’s color is orange. Their collars are practical. Their collars are snap locked with their name and my phone number embroidered on it. I don’t like using tags as they are flimsy and may fall off. I refused to buy collars that are spiked or studded as I refused to perpetuate the negative stereotypical notions of the breed of my dogs. They are my companions and are very loving and loyal. They don’t kill birds, cats or other animals that come into my house. In fact their best friend is Mack, our galah who bullies them with his screeches. I also buy thunder shirts and Adaptil collars which I sue on them as soon as there are some changes of routines in the house. Once a month, my dogs are given flea treatment. They are given their C5 booster vaccination and routine checkups yearly and worming tablets every few months. Staffordshire Bull Terriers are a breed that very much needs to be a member of the family. They are not a dog that can be left alone in the back yard to amuse themselves. They love to have a regular walk, a ride in the car and in general, be included in your family’s day-to-day activities. Exercise, good diet, affection and discipline are all needed to keep your dog functioning as a happy and healthy pet who gives back a lot more than he receives. Staffords need attention on a constant basis and if neglected can become bored and problematic. Also keep in mind that whilst they are a loyal and devoted family pet they are also very strong active dogs that require regular exercise. Do make sure your pets are covered by pet insurance. Pet insurance is something all three dogs had and are having .Although we didn’t use much of it when they were younger, the insurance had come in real helpful as they got older. It paid for Buddha’s oncologist treatments, Fu’s ongoing back issues and Tara’s recent corneal ulcer. 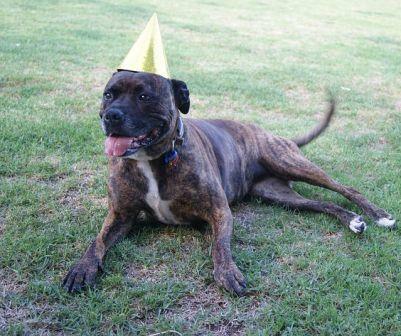 And the last point I am making is when you get a staffy, you have to realise it is more than a ten year commitment. Make sure you are capable of doing it with fidelity. If not, get another breed. I’m a single woman with three staffies and I made sure my commitment to them is with fidelity and priority. When I decided to get Tara, I actually calculated my age to see how old I would be by the time Tara is 15 years old and whether I would be capable enough when I am in my 60’s to handle a young energetic staffy. My dogs are in my will and provisions are made for them in case anything happens to me. They are not just my dogs. They are sentient beings who deserve to be treated with love and respect too, not abandoned on a whim and rehomed. Some photo credits also go to Kellie Jayne Photography. Also, here is a link to Buddha’s final journey which was done by Caveira Photography. Why Choose a Staffordshire Bull Terrier? What type of owners buy a Staffordshire Bull Terrier? What in your opinion are the best things about the Staffordshire Bull Terrier breed? Why do you think the Staffordshire Bull Terrier is special? What are your favourite things about the Staffordshire Bull Terrier? Are you glad you choose to buy a Staffordshire Bull Terrier and not another breed? How would you describe the Staffordshire Bull Terrier temperament? What advice might you give to people thinking about whether they should buy a Staffordshire Bull Terrier over other breeds? What are the history and origins of the Staffordshire Bull Terrier? What colors of Staffordshire Bull Terrier are most popular? What does the Staffordshire Bull Terrier look like? What are the pros/cons of the Staffordshire Bull Terrier breed? What can a new owner expect in terms of differences between the Staffordshire Bull Terrier and other breeds? What type of typical personality does the Staffordshire Bull Terrier have? Is it possible to describe a fairly typical Staffordshire Bull Terrier? What is the breed standard/description for the Staffordshire Bull Terrier? Are there any downsides to owning a Staffordshire Bull Terrier that prospective owners should be aware of? Is the Staffordshire Bull Terrier breed of dog suitable for first-time dog owners? Some breeds can be described as greedy and prone to weight issues, would this apply to the Staffordshire Bull Terrier? Is the Staffordshire Bull Terrier breed suitable for a person or family that are out at work all day? 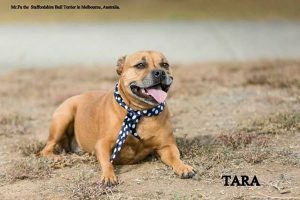 Some owners seek a breed suitable for barking and offering a guard dog role – how does the Staffordshire Bull Terrier match up to that role? Are there myths about the Staffordshire Bull Terrier – in other words do new potential owners come to you with misconceptions about this breed? What types of questions do you get once owners get their Staffordshire Bull Terrier home? What is the typical temperament of a Staffordshire Bull Terrier, so people know what to expect from their new pet? When fully grown how much on average does a Staffordshire Bull Terrier weigh? When the Staffordshire Bull Terrier is full grown in size what is the maximum height and length expected to be? Is the Staffordshire Bull Terrier ever crossed or mixed with other breeds of dog? Does the Staffordshire Bull Terrier smell or drool a lot? Do you have a Staffordshire Bull Terrier growth chart? What breed group does the Staffordshire Bull Terrier come under? Are there some types of people that you can suggest the Staffordshire Bull Terrier is not suitable for, perhaps families? How is the Staffordshire Bull Terrier with children? Do you think the Staffordshire Bull Terrier is suitable for families with young children? How does the Staffordshire Bull Terrier get along with other (existing) pets and do you have any tips or advice for new Staffordshire Bull Terrier owners in terms of successful integration? Is it better to buy one Staffordshire Bull Terrier or two? Would the Staffordshire Bull Terrier be suitable as a guard dog? Can I leave my Staffordshire Bull Terrier during the day while I go to work? What is the expected average lifespan of the Staffordshire Bull Terrier? In terms of life expectancy, how long on average would the Staffordshire Bull Terrier breed live to? How to handle the Staffordshire Bull Terrier puppy to start off – how much food, what type, how often? Do owners need to consider supplements for their Staffordshire Bull Terrier? How much did your Staffordshire Bull Terrier cost to buy? Can you offer advice to people looking to buy a Staffordshire Bull Terrier and how much should they spend? What advice would you offer new Staffordshire Bull Terrier owners? What types of people are buying the Staffordshire Bull Terrier and why? Where can I buy Staffordshire Bull Terrier rescue dogs or find a Staffordshire Bull Terrier for adoption? Please note that buying or searching for a ‘cheap’ Staffordshire Bull Terrier can be false economy as they may have health issues that cost you far more in the long-term – always buy from a good and responsible breeder! How would you describe the Staffordshire Bull Terrier puppy to potential new owners? What types of owners are best suited to owning a Staffordshire Bull Terrier? What inspired you to become a breeder and did you start with the Staffordshire Bull Terrier? As a Staffordshire Bull Terrier breed expert, are there any ‘essential’ tips you would like to share with new owners? How long does it take to housetrain/potty train a Staffordshire Bull Terrier? We invite you to email us your Staffordshire Bull Terrier’s pictures, in particular we are looking for photos showing Staffordshire Bull Terrier puppies at 1, 2, 3, 4, 5, 6, 7, 8, 9, 10, 11 and 12 weeks old as well as early pictures such as 1, 2, 3, 4, 5, 6, 7, 8, 9, 10 and 11 months old to a year old. Do they have any nicknames or does the Staffordshire Bull Terrier have popular names? If my Staffordshire Bull Terrier is pregnant what might the litter size be? Could the Staffordshire Bull Terrier be dangerous around young children? How do you prevent a Staffordshire Bull Terrier biting? How do you prevent a Staffordshire Bull Terrier chewing? How do you stop a Staffordshire Bull Terrier jumping up? Does the Staffordshire Bull Terrier have an issue with excessive digging? Why does my Staffordshire Bull Terrier keep growling and barking? Is there a reason my Staffordshire Bull Terrier dog is often scratching excessively? 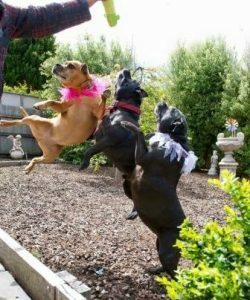 In comparison perhaps to other breeds what can you say about the Staffordshire Bull Terrier and their exercise needs and do you have any tips or advice for new Staffordshire Bull Terrier owners? As a breeder of the Staffordshire Bull Terrier , do you prefer a collar or harness? As an expert of the Staffordshire Bull Terrier breed do you prefer a standard leash or retractable? Can you offer any dog walking tips for Staffordshire Bull Terrier owners? What games and toys can you recommend for the Staffordshire Bull Terrier? How intelligent is the Staffordshire Bull Terrier compared to other dog breeds? Do you have any special grooming routines or tips and advice for new Staffordshire Bull Terrier owners? What accessories are required to be purchased for grooming a Staffordshire Bull Terrier? How much do Staffordshire Bull Terrier shed and how do I maintain their hair and how often? Is the Staffordshire Bull Terrier a hypoallergenic breed? Any advice/tips you can give concerning cleaning and bathing your Staffordshire Bull Terrier? Can you offer new Staffordshire Bull Terrier owners advice concerning fleas and maybe products you use in treatment and prevention? What advice and tips could you offer to owners who might wish to follow your path in showing the Staffordshire Bull Terrier? What started your interest in showing the Staffordshire Bull Terrier? If a new owner perhaps wanted to meet other owners or find out more – perhaps they have an interest in joining a local club or maybe they wonder how they can start showing their Staffordshire Bull Terrier – where would they begin? How would an owner know they have a show-quality Staffordshire Bull Terrier and how would they start off? What official organisations are there for the new Staffordshire Bull Terrier owner and what benefits or services do they provide? In buying a Staffordshire Bull Terrier, can you offer advice and tips to new owners? How did you progress to becoming a breeder and why focus on breeding the Staffordshire Bull Terrier out of all the breeds you could have chosen? What do you think makes the Staffordshire Bull Terrier special to you? In comparison perhaps to other breeds what is it like to train a Staffordshire Bull Terrier and do you have any tips or advice for new Staffordshire Bull Terrier owners? How should new owners approach bringing a new Staffordshire Bull Terrier home, any advice and tips you can give? Should I allow my Staffordshire Bull Terrier to sleep in my bed or elsewhere in the house? Should my Staffordshire Bull Terrier sleep in a kennel or crate? Health is always a major concern when buying a dog, do you have any advice for new Staffordshire Bull Terrier owners to be aware of in particular? What is the recommended schedule for vaccinations for your Staffordshire Bull Terrier? What type of health issues can a Staffordshire Bull Terrier have and how do you deal with preventing these? Why does my Staffordshire Bull Terrier have diarrhea? Why is my Staffordshire Bull Terrier vomiting and do I go to the vets? When should I take my Staffordshire Bull Terrier for vaccinations and which ones do they need and how often? How often will my Staffordshire Bull Terrier be in heat? Should I consider getting my Staffordshire Bull Terrier spayed or neutered and when and how much does this cost and what are the benefits? My Staffordshire Bull Terrier is limping, what should I do and should I go to a veterinarian surgeon? Why is my Staffordshire Bull Terrier not eating? How much does it cost to insure my Staffordshire Bull Terrier? What healthcare issues or diseases might be excluded from companies that provide Staffordshire Bull Terrier dog health insurance? What age would you class as an ‘older or senior’ Staffordshire Bull Terrier? What changes in food and diet would you suggest making for an older Staffordshire Bull Terrier? Do you feed any supplements to an older Staffordshire Bull Terrier – or anything else which helps them as they age? Are there any health issues particular to a senior Staffordshire Bull Terrier dog? Do you have any advice for owners of an older/senior Staffordshire Bull Terrier or tips you can pass on?